So here’s the DroneGuard CS400 with my Hitec Q-Cop 450 drone, transmitter, and all of the other goodies that go along with flying a drone. I placed the transmitter on the left side, the drone in the center along with the prop guards, and on the right side; my battery, chargers, WiFi repeater, memory cards, and more. At the top, I have my propellers, screw driver, and a few tools in the zipper. Now the Q-Cop 450 is a a lot larger than the DJI Phantom 3 Standard, Phantom 3 Pro/Advance, and the Phantom 2 Vision+. The Q-Cop 450 comes in at 450mm diagonally which means it fits fine in the DroneGuard CS400 but you can’t have the propellers installed as well. While the DJI Phantom series, coming in at only 350mm diagonally, you CAN have the propellers installed while housing them in the DroneGuard CS400 which is a nice feature and allows for you to get up in the air even quicker. Taking a closer look, you can see that the padding around the drone provides plenty of protection but more importantly, prevents the drone from shifting during transportation. 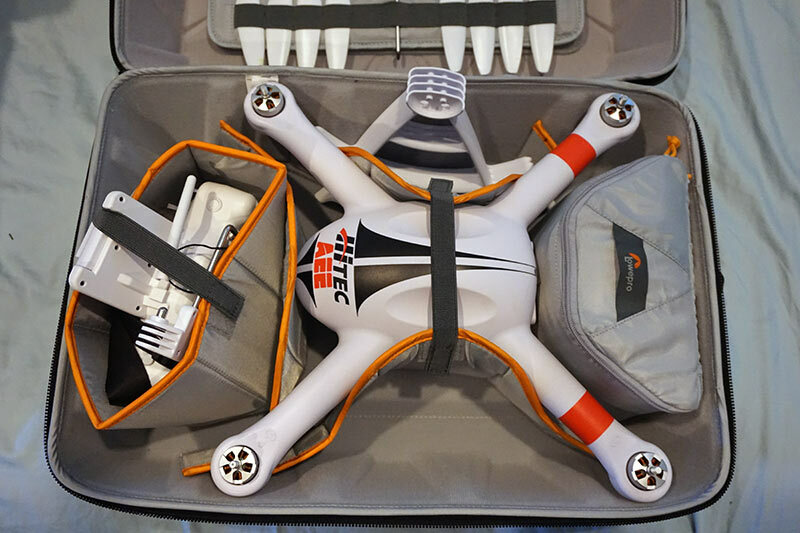 It also features a strap that secures the drone in place as well. The transmitter holder also includes a strap too, since its an open holder. All of the components are Velcro’d and easily movable. You can shift things around to make things customized to fit your setup. The zipper pouch had room for my extra battery, WiFi repeater, memory cards, chargers, and even additional room to spare. Finally, the outside zipper pouch is where I stored my flight log book and pen. This zipper pouch is VERY tight, so it won’t fit much and barely fit my notebook which is unfortunate. Read on to the next page and we’ll wrap and find out my final thoughts on the Lowepro CS 400 DroneGuard!